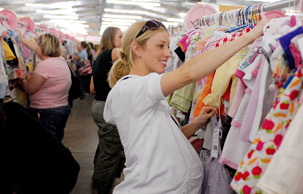 PRIME TIME SHOPPING gets you the BIGGEST selection at the BEST PRICES on everything you can imagine for newborns to teens!! So click HERE to buy your ticket NOW and shop BEFORE the public, and BEFORE we invite First Time Parents, Military Families, Foster Parents, and Teacher to shop the presale! This tickets lets you shop the evening before our public event opens! 4pm-8pm on Wednesday! If you are currently expecting your first child or your child is less than 12 months old, you qualify! Get your First Time Parent Early Shopping Ticket by clicking HERE. This free tickets lets you shop early the evening before our public event opens! 5pm-8pm on Wednesday! Sorry, if you have shopped early as a First Time Parent previously, you may not sign up to shop early again. We are so thankful for the service and sacrifice your family makes everyday! 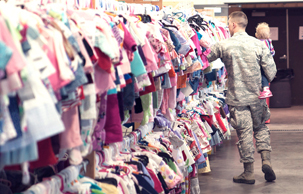 Get your Military Family Early Shopping Ticket by clicking HERE. This free tickets lets you shop early the evening before our public event opens! 5pm-8pm on Wednesday! Thank you for helping our community's children. Get your Teacher or Foster Parents Early Shopping Ticket by clicking HERE. This free tickets lets you shop early the evening before our public event opens! 5pm-8pm on Wednesday!